← Do You Have This in Taupe? The Mona Lisa isn’t necessarily the best painting ever; there are some experts who say it isn’t even the best painting by Leonardo da Vinci. A strong case can be made, however, that it is the most famous painting in the world. And if it isn’t the very best ever, it’s still a masterpiece that had a profound influence on subsequent artists. There are a lot of theories about who the woman in the picture is — one of the strangest suggests that Leonardo painted himself dressed as a woman. The earliest explanation, from Giorgio Vasari’s biography (1550), is that the artist “undertook to execute for Francesco del Giocondo the portrait of Mona Lisa, his wife.” That’s why in Italy the painting is called La Gioconda, and in France it’s known as La Joconde. In portraits painted prior to the early 1500s, you’ll notice that most of them were full length, and the subject was shown on his throne or in her castle, but not usually outdoors. Leonardo broke those conventions when he began the Mona Lisa in 1503: She is shown in closeup, so to speak — not full length. Her arm is almost coming out of the picture, as if she’s resting it on the edge of a balcony. But where could that balcony be? To what building is it attached? That’s impossible to say, because the background is a wild, fanciful landscape. We are having a close encounter with someone in a location that appears to be a very long way from downtown Florence. Another departure from convention was Leonardo’s use of oil-based paint. He was experimenting with a technique that is now called sfumato, an Italian word that basically means “smoky”. Whether we call it smoky or misty or hazy, he was going for an effect in which forms merge into each other, eliminating sharp lines and creating gradations between light and shadow. Five hundred years later our reaction may be, “yeah, I’ve seen that before,” but during the Renaissance, other artists saw what Leonardo did and exclaimed, “Cool!” (in Italian, of course). Relatively few people got to see the Mona Lisa until the 19th century, and ironically, what secured the painting’s fame was its disappearance. It was stolen from the Louvre in 1911 (see my post of 5/6/09). That put her face in every newspaper; people in all parts of the world became familiar with La Gioconda‘s smile. It’s that enigmatic countenance that sets her apart from other paintings. What is her smile expressing: Melancholy? Flirtation? Tenderness? For me, it’s as if some unseen person has just said something outlandish; Mona and I are exchanging an amused glance while the windbag blathers on. How about you — what do you think her smile conveys? What’s so great about the Mona Lisa? 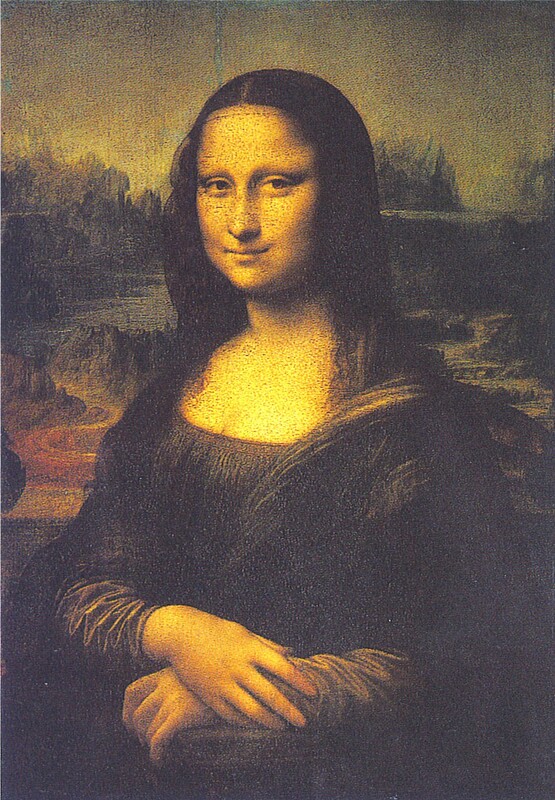 This entry was posted in Art and tagged Mona Lisa. Bookmark the permalink. I think she’s pregnant; the baby is Leonardo’s; and she’s trying to figure out how to tell him… and his wife.